Hart Mountain Hot Springs or Antelope Hot Springs are a collection of springs nestled perfectly within the confines of the Hart Mountain National Antelope Refuge. The main 8 by 11 feet soaking pool, bordered by rock walls, is 4-foot deep. Another smaller undeveloped pool is located 100 yards away. A rancher is said to have stuck a stick of dynamite into a rock with bubbling water spouting out of it, thus leading to the creation of the Hart Mountain Hot Springs. Established in 1936, Hart Mountain National Antelope Refuge is the perfect location for camping in the warmer months of the spring, summer, and the fall. Be well prepared because sometimes high desert conditions can be extreme. Due to a higher altitude, nighttime temperatures can go below the freezing point at any time of the year. During the hot summer months stay hydrated, use sunscreen and insect repellent. This destination features a multitude of excellent spots for hunting, fishing, rock hounding and of course wildlife observation. The refuge, in its entirety, is breathtakingly scenic and is the ideal location for long enjoyable hikes. For all those desiring a stunning camping location, the camping spots at Hart Mountain are made additionally spectacular by the abundance of cool springs and crackling creeks. Furthermore, accessible all year round, the main hot spring is surrounded by rustic stone walls protecting those within from the chills of the cold winds. 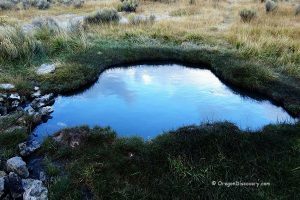 The developed spring is quite deep and for those not wanting to be engulfed by the water, the undeveloped springs are ideal. With a splendid unimpeded view of the mountain ranges, these springs are the absolute top notch. The pool’s gravel and bedrock bottom provide the base for lovely spring water to bubble up from. The Hart Mountain, Frenchglen, Blue Sky, and Hot Springs Roads are open and maintained year-round. Any vehicles can be used. Other National Refuge's roads are not maintained. Four-wheel drive vehicles with high clearance are recommended. Any road can become hazardous due to storms, drifting snow, muddy conditions, or landslides. Check current road conditions on the U.S. Fish & Wildlife Service website. 386 miles northeast of Portland. The 278-acre Hart Mountain National Antelope Refuge was established for the conservation of remnant herds of pronghorn antelope. The fastest land animal in North America, pronghorn are able to develop speeds over 60 miles per hour (96 km/h). The interesting fact: the African cheetah, the fastest mammals in the world, can achieve speeds of up to 61 miles per hour (98 km/h), that is just slightly more than pronghorn. Other protected 69 species of mammals and 246 species of birds that include California bighorn sheep, mule deer, coyotes, sage-grouse, and others. Allowed year-round up to 14 days in designated campgrounds. Camp Hart Mountain - 8 campsites, accommodate trailers, vault toilets, picnic tables, fire rings, generators, wheelchair accessible. Hot Springs - 25 campsites, accommodate trailers 24 ft maximum, vault toilets, fire rings, generators, wheelchair accessible. Post Meadows - 4 campsites, accommodate trailers, vault toilets. Fishing, horseback riding. Guano Creek (vehicles is ok from the 1st August to the 1st December) - 10 campsites, vault toilets, wheelchair accessible. Fishing. Backcountry Camping. It is required to obtain a self-issued permit at the Refuge Headquarters or online. The open terrain of the refuge provides a great opportunity for hiking but trails are not maintained. The hikes to DeGarmo Notch, Barnhardi Cabin, and Warner Pick begin from the Hot Springs Campground. Along the western edges of the mountains, rocks collectors can find beautiful agates, jaspers, fire opals, and petrified wood. Check current rockhounding regulations. Removing artifacts, arrowheads, petroglyphs, and plants is prohibited. The Refuge provides opportunities for trout fishing at Rock Creek, Guano Creek, and at Warner Pond which is wheelchair accessible, open for non-motorized boats and has a floating dock. A special use permit is required for all people to photograph near sage-grouse leks between the 1st March and 1st June. A permit is required for any commercial photography and video productions. Check the website to fill out an application. Turn left onto Hot Springs Road and continue 4.4 miles to the Hart Mountain (Antelope) Hot Springs and campground. Bear slight right onto Hot Springs Road and continue 4.4 miles to the Hart Mountain (Antelope) Hot Springs and campground. We were wondering what the road conditions were like up to the campgrounds as well as the distances to the hot springs from each? Is pulling a small trailer doable, or do the roads rattle it too much? Thanks!